Gold fever has captured the Chinese during the Lunar New Year holiday festival marking the start of the Chinese year of the Dragon and the Chinese Year of the Dragon could easily be called the Chinese Year of Gold. Recent information from China's Ministry of Commerce recently showed that the sales of gold, silver and jewelry at Caibai, a major Beijing gold retailer, rose a massive 57.6% Also the state news agency Xinhua reported that both Caibai and Guohua, another top gold retailer, reached about 600 million yuan (US $95.28 million) in total sales. Beijing's Municipal Commission of Commerce said the week-long holiday produced a 49.7% jump in sales over last year's festival. All across China sales are booming with customers crowding into jewelers to buy up all the New Year's gold bars, gold ingots and other kinds of dragon-themed jewelry they can lay their hands on. Over the past few months the Chinese government has been encouraging its citizen to buy gold and hold as much gold as they can. Many analysts believe this is part of a strategy to build up the assets in the face of a weakening US dollar and European euro. Assistant Manager Guan Qiang at Caibai told Xinhua News, "To most Chinese nowadays, gold is more convenient to cash in than other investment instruments. Despite common investment risks, the price of gold is clear and easy to judge." And Liu Yangyi, a Shanghai Gold Exchange Trader, told the Global Times, "Many Chinese people lost lots of money in property and stock investments in 2011, so they prefer to buy gold to maintain the value of their savings amid high inflation." "Chinese do not value gold only in sentimental terms. The precious metal is also expected to maintain or increase its value, as evidenced by the surging investment demand seen around the country," said another. The Shanghai Gold & Jewelry Trade Association is expecting gold investment to hit 955.2 tonnes by 2020 according to Xinhua. "Besides, Chinese people have a special feeling toward the dragon, and sales of gold jewelry in the Year of the Dragon are much better than in other years," Liu said. One Beijing citizen, Miao Miao commented, "You can hardly even see the gold bars, necklaces and pendants in the display case. People seem crazy about gold, snatching it up more like a 'cheap cabbage' than such a precious metal," said Beijing resident Miao Miao. "You have to quickly decide whether to make a purchase, or it will be taken away by others." Miao, shopping for a pair of gold bracelets for her granddaughter continued, "When my daughter was born in 1984, we had no means or savings to buy her one as a keepsake. We can finally realize this dream by sending it to her daughter," Miao said. However, Chinese buy gold not just for beauty and sentimentality. There is a expectation of increased future value of investing in gold. This is evidenced by the continual rise in demand. only in only sentimental terms. The precious metal is also expected to maintain or increase its value, as evidenced by the surging investment demand seen around the country, insiders have said. 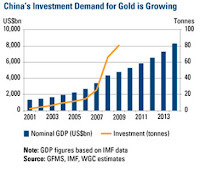 "To most Chinese, gold is more convenient to cash in than other investment instruments. Despite common investment risks, the price of gold is clear and easy to judge," said another resident. Strong demand for investments in gold and jewelry has driven China’s total gold demand to 750 metric tons in 2011, according to the World Gold Council and she is expected to surpass India as the top gold consumer in the next couple of years or so. "Despite the record-high price of gold, the demand for investments in gold and jewelry has continued to soar, with the market expected to reach about 955.2 metric tons by 2020, thanks to a growing middle class and a more affluent society." said Binghai, director of the Shanghai Gold & Jewelry Trade Association. The Chinese Year of Gold is upon us and now is the time to buy gold it seems. In any Asian culture, gold is considered more valuable than paper money. This applies to China as much if not more so than other Asian nations. Coupled with the rising standard of living and more cash to spend 300 million Chinese are about to buy gold in volumes never seen before on this planet. According to the World Gold Council, China is expecting to overtake the world’s top gold consumer, India during the coming years. 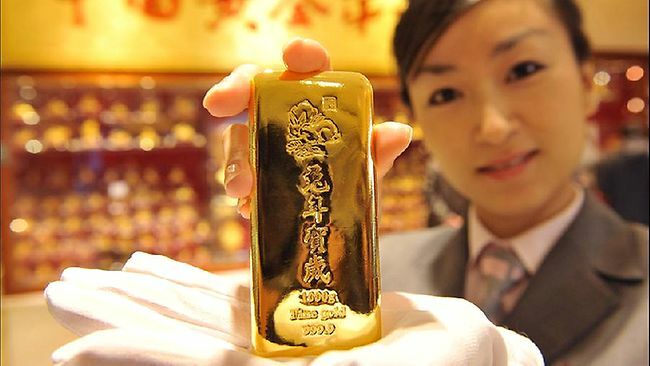 China accounted for 23 percent of the world's total consumer physical gold demand in the first nine months of 2011. An increase from 19 percent in 2010 and this trend looks set to continue. A growing middle class and demand for wealth in China is leading the demand for gold and the government is encouraging private ownership of gold. A Chinese shipping executive Ping Bo believes that buying gold is the best way to protect the family's wealth and give his 10-year-old son a kick-start. “For my son, the idea is that he will get a nice stash of gold that he can cash out when he turns 21 or when he gets married," said Ping. Over two million people have opened accounts in the past two years in order to accumulate gold at the Industrial and Commercial Bank of China (ICBC) who launched the accounts last April to encourage citizens to own gold. Investors can buy as little as one gram a month or as much as they can afford. "It's a fantastic way for me to accumulate gold," said Ping. ICBC's have 22 tonnes of gold ready for investors the number of which reached 2.33 million by the end of November. The Agricultural Bank of China launched their product in September, and have accumulated over 70,000 investors signed up to buy a minimum of one gram of gold per month. "The product will retain its vitality as long as the demand for physical gold investment keeps growing," said the bank in a written reply to a Reuters enquiry. It is likely that China’s heavy emphasis on gold investments will play a major contribution to the gold price this coming year. "The Chinese really love gold," said Shi Xudong, deputy head of the Administration Office of the Precious Metals Department at ICBC "The fact that the government has started to clean up the gold market is favourable to our business, as investors who have been trading on illegal platforms will need to look for new investment platforms." His reference was to a recent crack down on informal gold exchanges outside the government controlled Shanghai Gold Exchange and Shanghai Futures Exchange. Some analysts have predicted that there will be over 300 million Chinese gold investors in the market by the end of 2012. This is certainly feasible when you consider the middle class population is well over the 247 million at the last count. This is out of a population of 1.3 billion people and, growing at a rate of 8.5 percent per annum. This massive demand by Chinese investors keen to preserve their wealth is going to have a significant effect on the gold price in the coming years. Perhaps now is the right time to buy gold. There are, as always, many predictions for gold in 2012. Various gold buffs and serious investors all have their forecasts for 2012. 2000 dollars an ounce, 3000, 4500, even up to 10,000 has been ventured. Over the past year the gold price rose 11 percent overall. Over the past 30 odd years the gold price has maintained a steady increase in price, partially due to the deterioration of the value of currency but also due to the interest and eager value placed upon it by investors and banks (yes banks are now buying up gold in a frantic effort to bolster their asset value also). From 35 dollars an ounce up to over 1600 dollars is a 450 percent increase. Not many stocks can boast that sort of return. Looking to the future, here is what various analysts have said about the future gold price. At a recent Gold Symposium in Sydney Alf Field, using the Elliott Wave theory, predicts, "Once this present correction in gold has been completed it should [undergo] the largest and strongest wave in the entire gold bull market…to around $4,500 with only two 13% corrections along the way." Arnold Bock of Financial Summaries, in an article stated. "No wishful thinking here! As I see it gold is going to a parabolic top of $10,000 by 2012 for very good reasons: sovereign debt defaults, bankruptcies of “too big to fail” banks and other financial entities, currency inflation and devaluations - which will all contribute to rampant price inflation." And in March 2011 Bock further wrote, "2012 is shaping up to be the blockbuster main event of the ongoing financial crisis. Massive amounts of new debt, vast quantities of additional digital dollars and the spark of higher interest rates will set off version 2.0 of the credit-driven financial implosion." Taran Marwah stated, "Our target for Gold since October 2010 has been US$6000 by December 2012… thru Q2 2013... Excess money printing will cause debasing of the mighty US Dollar. In this scenario of hyperinflation, wherein the...US Dollar is collapsing, the only way to protect your wealth is holding on to 'Physical Gold'. Please start thinking on the lines of "wealth protection" and "preservation". 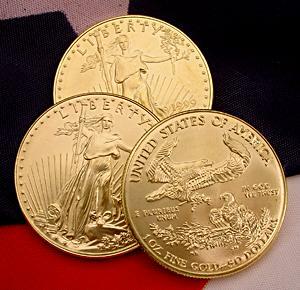 Physical Gold is the only financial asset in the world that is not simultaneously somebody else's liability. That is the reason why we have been advising everyone since 2009 to buy 'physical Gold' [and recommending that they] store the bars outside the commercial banking system as most commercial banks in USA and Europe will be "insolvent" by December 2012. We repeat - Physical Gold is the only asset which will give "best returns" from 2009 through 2012." Goldrunner a Fractal analyst, in his November, 2011 sets forth the basics of his technical analysis and stated, "Early this year we suggested a 50% rise in Gold to $1860 – $1,920 into mid-year. Now, we see the Gold tsunami realizing an approximate 100% rise that will crest at $3,000+ into the middle of 2012." Bob Chapman in last Augusts International Forecaster is expecting $2,500 - $3,000. "Debt monetization will lead to ever-higher inflation...and explain the systemic problem of many nations, which have nowhere to turn to except the creation of money and credit to temporarily keep their economies going...[and] when you put it all together you get higher gold and silver prices...We would expect a move to $2,000 to $2,200, some backing and filling and a move to $2,500 to $3,000 by the end of February 2012, as we earlier predicted." Kurtis Hemmerling, in an August 2011 article at Seeking Alpha entitled How to Play Parabolic Gold Prices With a $2,500-8,000 says, "While I put a one year price target of $2,500 - $3,000, it is difficult to know with any surety...but I think some added 'shock news' as we toy with another recession and the convoluted problems of the euro-zone, compounded by inflationary stimulus - will see the U.S. dollar-based price of gold go much higher over the next few months. My target is largely based on the recent steep climb that is getting dangerously close to setting up a parabolic price move. Fear is the catalyst, and I think resistance will be met at $2,000 based on it being a round psychological number. After some churning when it breaks that - we could see another big run between $2,500 and $3,000." And not to be outdone, money manager, Peter Schiff recently stated that, "Gold could reach $5,000 to $10,000 per ounce in the next 5 to 10 years". Gold in 2012 is looking good and there seems to be plenty of enthusiasm for gold and more encouragement for the gold standard so now is the time to buy gold. China are boosting their gold imports to record heights this month as the weeklong Luna New Year is about to start as a 'hedge against financial turmoil'. Currently, China's private gold savings is rivalled only by India but it seems not for long. 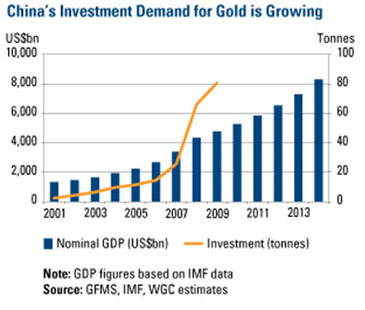 As well as importing gold China is also digging more gold out of the ground and, significantly, not exporting it. Citizens are being encouraged to own gold and the Chinese government is very closed mouthed about how much gold they actually have. No reports of the gold bullion stocks have been issued by the chiense government for two years ago when it indicated it had 33.89 million ounces, or 1,054 tons, as of June 30, 2009. Interestingly, just before the usual strong buying season of the Lunar New Year, the Chinese Government in Beijing shut down all gold exchanges with the except of the officially recognized Shanghai Gold Exchange and Shangai Futures Exchange. Is this an attempt to control the gold market in China and prevent gold from leaving the country? "China’s appetite for gold is very strong and growing," said Tao Jinfeng, chief investment consultant at Haitong Futures Co., "The few months before the Lunar New Year is typically the peak demand period for Chinese people." Of the 145,000 tones of gold in the world, China seems determined to ensure she has gets her share. China's boosting of gold imports is another indication of the future gold price and yet another incentive to buy gold while the price is still low.